Pinakbet or pakbet is a popular Ilocano dish, from the northern regions of the Philippines, although it has become popular throughout the archipelago. The word is the contracted form of the Ilocano word "pinakebbet", meaning shrunk or shrivelled. The original Ilocano pinakbet uses bagoong, of fermented monamon or other fish, while further south, bagoong alamang is used. 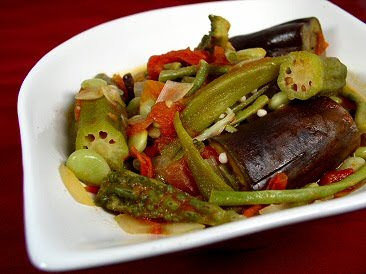 The basic vegetables used in this dish include native bitter melon,eggplant, tomato, ginger, okra, string beans, lima beans, chili peppers , parda and winged beans. Brown the ginger, garlic, and onion. Add the tomatoes and cook for a few minutes. Add two cups of water and the remaining ingredients. Simmer vigorously for 20 minutes, stirring often. It's done when the liquid is thick and the vegetables are tender. Add salt if necessary, remove the ginger, and serve.